This is a mid blue marble effect vitreous glass tile with added Gold coloured highlights. So far we haven't found two tiles the same and you will have something new to discover every time you look at them! Boxes of this mid blue marble effect glass mosaic tile with gold coloured streaks contain 10 sheets of 225 separate tesserae that are held together on a plastic mesh. Each tile is 2cm x 2cm square and 4mm thick. There is a total of 2,250 individual mosaic tesserae per box. Each box covers an area of approximately 1.07 square metres / 11.51 sq ft. 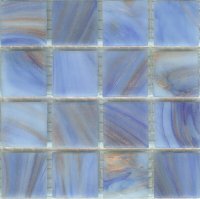 Sheets of this mid blue marble effect glass mosaic tile with gold coloured streaks contain 225 separate mosaic tiles in a 15 tile by 15 tile grid, with the tiles held together on a plastic mesh. Each tile is 2cm x 2cm square and 4mm thick. Each sheet covers an area of approximately 0.107 square metres / 1.15 sq ft.
Did you know the Golden Hall of Stockholm's City Hall is named for the 18 million pieces of gold mosaic and glass covering its walls. The hall can hold up to 700 people and the mosaics on the walls represent important events in Sweden and the world.